Steel Gray Key Cabinet. Heavy Duty. You Can Add To This One As Your Requirements Increase. Each Panel is Removable and Will Last a Lifetime. 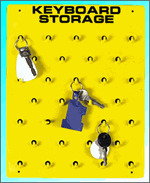 Dimensions: 19 3/4"W x 25" H x 5"D. 60 Key Capacity to 240 Key Capacity. Hooks On One Side Only. Wall Mount Cabinet Capacity: 60,120,180 & 240. Both Furnished With Numbered Labels & Shields. Key Cabinet Holds 60 Sets of Keys. Available in Sand Color Only. Choose From 5 Convenient Sizes. 105 Hook 32" x 29 1/2", 75 Hook 24" x 31 3/4", 55 Hook 18 1/2" x 29 5/8", 38 Hook 16" x 23 1/2" And 32 Hook Economy 13 1/2" x 20".